Julie Goodnight clinics focus on understanding the horse’s natural behavior, improving the relationship between horse and rider and developing the rider’s skill and ability to communicate with and control the horse. You’ll leave with a better understanding of your horse and tools to help you create the connection you want! Goodnight offers 2- to 5-day clinics on topics ranging from general horsemanship to wholeness retreats, ranch riding and trail riding; open to riders of all breeds, disciplines and ability levels. Bring your horse and get personalized coaching or come as a spectator and learn from observing Goodnight work with all the horses. Adult tickets are $25.00 per day and age 17 and under are $15.00 per day. 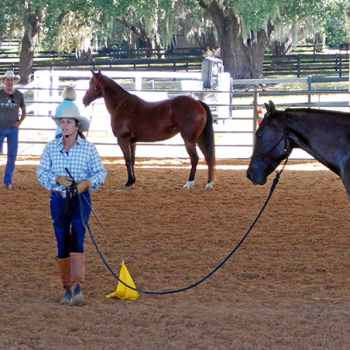 Bring your horse/s and work with Julie to improve your horsemanship. Stabling available (extra fee); school horses available at some sites. $650 for both days; to register call 719-530-0531 or register online when you choose to pay the full amount. You may select to pay the deposit if you register by phone. Full payment required prior to the clinic. 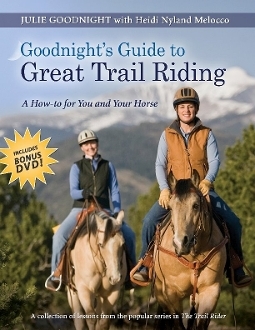 Goodnight clinics are focused on developing your leadership skills through ground work and improving your riding skills. We will focus on your equitation as well as addressing training goals for your horse. Each horse and each rider is met at his/her own level. Everyone works at their own pace, so do not be concerned about you or your horse’s fitness level– take a break whenever you need one! The information presented in the clinic will be comprehensive in nature, starting with fundamentals and progressing through advanced skills. Minimum skills required of horse and rider: basic control at walk and trot. You are not required to canter although there will be plenty of cantering for those that are ready for it. There will be two sections of riders– a maximum of 15 riders in each section; Julie will place the riders in the section according to your Personal Profile, which you will complete after registering. Each section will have two sessions a day in the arena with Julie; two hours of ground work in the morning and two hours of mounted work in the afternoon, plus practice time, with Julie’s assistant. The focus is on building a better relationship with your horse, improving your riding skills and gaining more authority over your horse, both from the ground and in the saddle. The content progresses throughout the clinic so that each session builds upon the other. After each session in the arena, you will have time to practice the skills learned, with coaching from Julie’s assistant, then you will rest your horse and listen in on the other section’s main lesson (you’ll have time to practice these skills in your next session). Every horse and participant works at their own level and speed. 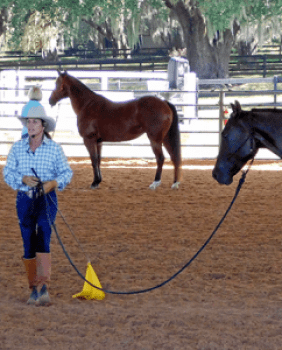 Sections allow for smaller groups, divided by the skill level of both horse and rider, to ensure that everyone gets the personal attention they need and that each horse and rider is challenged at the appropriate level. Spectators at Goodnight’s clinics enjoy watching all the horses and riders and learning from a broader perspective. Observe the details, ask questions, make notes and network with others in a friendly and growth-oriented environment. FREE SHIPPING to the US | Coupon Code: Spring19 7 Days 11 Hours 40 Minutes 21 Seconds Left!